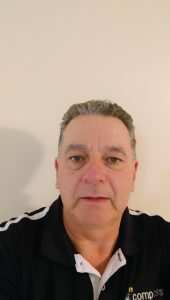 Barrie Kershaw comes with 20 years of experience in the transport industry working as a driver, transport supervisor and work place health and safety coordinator for a major transport company in Perth. In that time he developed skills in training and induction and in all aspects of transport and logistics. He then decided that by becoming a driving instructor he could make a difference, at ground level, to the rising costs to our community in human lives and resources, from road trauma in WA. A quote from Barrie: “I just want to teach skills and attitudes that may, one day, save a life”. At Compass Driving School, your instructor will strive to supply vehicles that are not only safe for you to train in, but are environmentally friendly. We use a Hyundai i30 that utilises the latest in safety features including Front air Bags, ESP (Electronic Stability Program), ABS (Antilock Breaking System) and active seatbelt warning alarms. 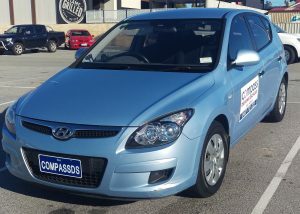 AMCAP has given the Hyundai i30 model we use a 4 star safety rating. The Hyundai i30 also utilises the latest in diesel engine technology and was awarded Car of the Year and Green Car of the year in 2007 by CarsGuide. 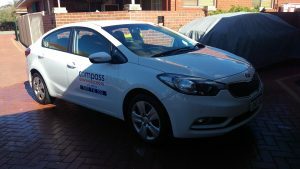 In this very car, Barrie will have you drive all around Perth, going anywhere within Cannington , Midland and Mirrabooka and surrounding areas. The Automatic Car you will be driving is a Kia Cerato Sedan that utilises the latest in safety features including Front air Bags, ESP (Electronic Stability Program), ABS (Antilock Breaking System) and active seatbelt warning alarms. AMCAP has given the Kia Cerato model we use a 4 star safety rating. Our manual and automatic driving instructor is passionate about teaching new drivers the skills they will need to become safe economical drivers. If you would like to get in touch with Barrie to learn how to drive and be independent, please call or text him on 0417 712 223.